Hola! 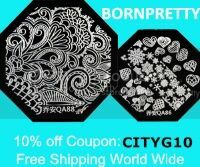 I'm back with another review--these pretty black gems from Born Pretty Store! 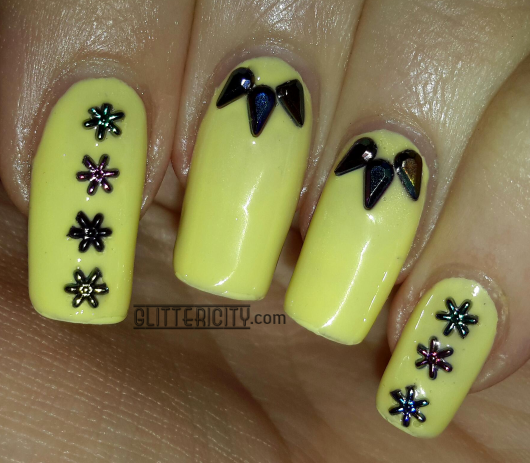 These gorgeous gems can be found here! A whole wheel of pretty black teardrops and flower/star thingys. I fell in love when I saw these on the website, and was delighted to see they lived up to my expectations in person :D they remind me of an oil slick in the rain! Very pretty! There are also others in the set that are the same shapes, but instead of different colours, the shine is a dark silver/gunmetal. 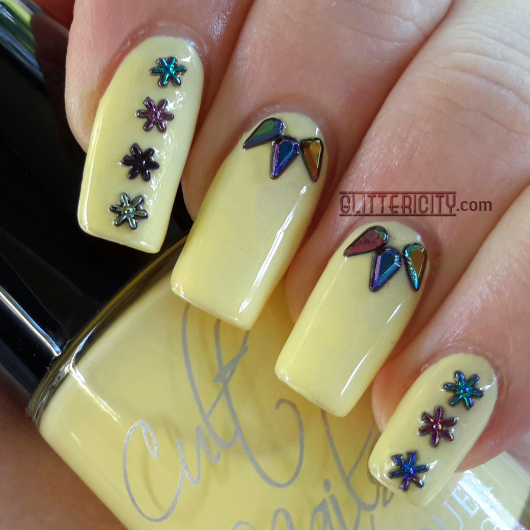 I used two coats of New Day by Cult Nails for the base--this nice lemon-yellow creme is a great pairing with the gems, isn't it? I used topcoat to adhere these, and then sealed it in with another coat. The only tiny complaint I have is that a lot of the little stars have broken bits--you can see one of them at the cuticle on my small finger. It isn't too noticeable, but they're so pretty I do wish all of them were perfect! There are still plenty of them in usable shape, though. I played poker last night and got several compliments on these :) I'm always so chuffed when my hard work gets noticed by anyone. Even though it's work I totally love doing, of course!